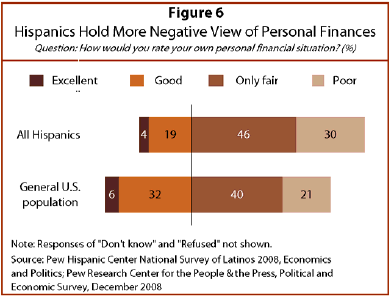 While Latinos and the general U.S. population share similar views on the current situation of the U.S. economy, Latinos hold a more negative view of their own current personal financial situation than does the general public. More than three-quarters (75%) of Hispanics say their personal finances are in poor (30%) or fair shape (46%). Among the general population, 61% report that they are in either only fair (40%) or poor (21%) shape financially. Assessments of personal financial situations are worse among the foreign born than among the native born. More than eight-in-ten (84%) foreign-born Hispanics report that their finances are in either poor (34%) or only fair (50%) shape. Among native-born Hispanics, two-thirds (66%) say this (25% report being in poor shape and 41% say only fair shape). Among the foreign born, a shorter tenure in the United States is associated with more negative evaluations of current personal finances—90% of immigrants who arrived within the last 20 years report poor or only fair financial situations, a condition reported by 73% of respondents who have lived in the U.S. longer. Ratings of personal finances are highly correlated with educational attainment. Fully 87% of Hispanics who do not have a high school diploma report that their personal financial situation is fair or poor. Among Hispanics with a high school diploma, this figure falls to 76%, and among Hispanics with a college degree or more, it falls to 49%. Among the employed, 71% say their personal financial situation is only fair or poor, while 81% of Hispanics who are not employed say the same. Some 43% of Latinos say their personal financial situation has worsened in the past year, while 41% report no change in their economic situation, and 15% report that their situation has improved. Latinos who report that their own present financial situation is fair or poor are especially likely to report financial declines in the past year—51% say as much. Fewer than one-in-five (19%) Latinos who evaluate their present finances as good or excellent report that their financial condition has worsened over the past year. Almost half of the foreign born (46%) report that their financial situation has worsened over the past year, compared with 39% of the native born. Despite (or perhaps because of) the grim state of their current personal finances, two-thirds (67%) of Hispanics expect to see improvement in the coming year, with 16% expecting a lot of improvement, and 51% expecting some improvement. Just 8% of Hispanics expect their situation to remain unchanged, and 16% expect more financial declines. In comparison, some 56% of the general public expects their financial situation to improve a lot or a little over the coming months, and 27% expect a decline in the financial circumstances of their families. Employed Latinos are a bit more likely than Latinos who are not employed to expect declines over the coming year in their personal finances—18% versus 13%. By the same token, the native born are more likely than the foreign born to expect a worsening of their condition—18% versus 14%. And among the foreign born, immigrants who have been in the U.S. for more than 20 years are more likely than recent immigrants to expect their financial situation to worsen in the coming months—17% versus 11%. 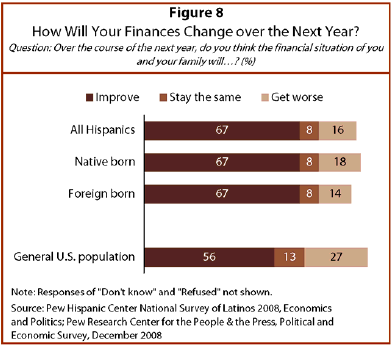 Hispanics’ outlook is not related to the present evaluation of their finances. Rather, the likelihood of optimism about the future is just as high for those who perceive their present situation as excellent or good (65%) as it is for those who consider their present financial situation to be fair or poor (68%).